I started this painting on location at Riverside Potomac Farm in Lucketts, VA. By the time I have completed the block-in I was cold and it was just about to start raining. I packed up my gear and headed home, where I finished the painting in my studio. The bushes at the focal point of the painting were actually the hardest part to get right: I scraped that area back and repainted it a couple of times. 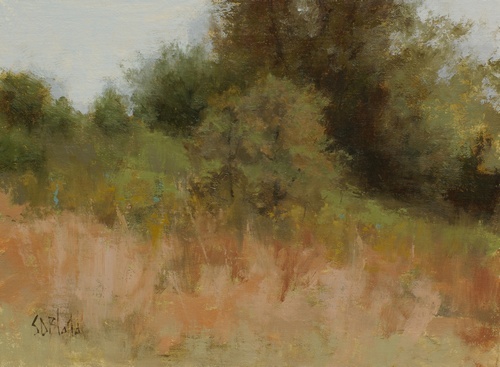 I kept the feel of a plein air painting by allowing myself the same amount of time to work on it in the studio that I would have had out in the field (with a little extra time added for scraping and re-painting).